Hands of Stone (2016) is the film based on the true story of Roberto Duran. A story of how combat sports changed one man's life and helped him overcome odds in a difficult time. Boxing films are often about making a come back. Overcoming adversity is a common theme in them but sometimes the story can get a little sidelined and this film unfortunately falls victim to that. It is still a great film about one of the best times in boxing's history. However, the story of Roberto Duran told by his trainer, Ray Arcel played by Robert De Niro made it a little hard to follow the narrative. While all the things and people involved in Duran's life probably could stand alone as their own film, this film tried very hard to squeeze it all in. Because of that, you may find yourself asking where certain characters that pop up midway through the film are coming from. Even if you are not that into boxing, if you grew up in the 70's and 80's the fights between Duran and "Sugar" Ray Leonard are probably something you can recollect being big news. The film does a good job of covering that, but it still feels like they rushed to get there. The in ring fight choreography is not bad, but the dialogue between rounds feels a little too long to make it believable. Edgar Ramirez plays Duran and he does an excellent job in his performance especially Duran's ups and downs with his emotions and paranoia when it comes to his success. Raymond's portrayal of Leonard is good but it felt as if there could have been more, but some was squeezed out to try and fit other stories in. It doesn't ruin the film, but it makes it feel longer than it should. De Niro's performance steals the show, so I guess that is why they went with his characters narrative for the film. It's not a bad movie, but its what we would qualify as a "solid rental". 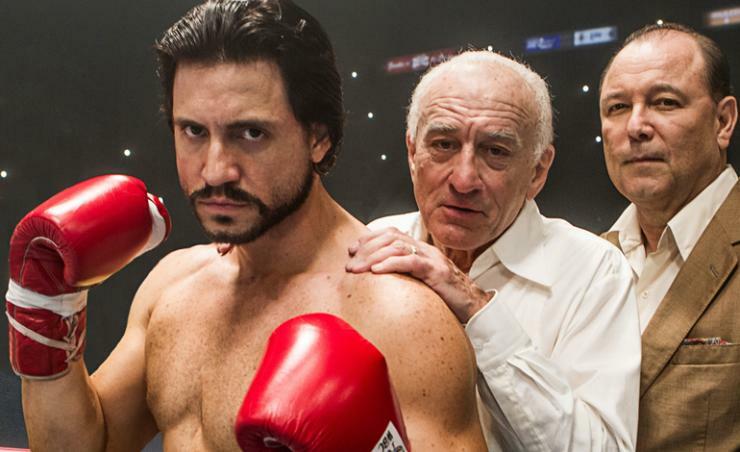 Hands of Stone is rated 'R' for violence and sexual situations.